For a few years now we have been promised all electric cars and they are slowly but surely becoming a reality on our roads. However, for many buyers, the purchase of an electric car is the result of a calculated, rational choice based on economy and environmental considerations. Most electric cars aren’t marketed for their driving experience. Except for Tesla that is; the company, led by CEO Elon Musk (founder of Paypal and CEO of the private space transport company SpaceX) has managed to design and produce exciting electric cars. They are using innovation and high tech to push the envelope and serve as a catalyst and positive example to other automakers. Musk’s vision and determination is paying off and I for one am very impressed by the cars they are producing as well as the fact that they’ve managed to create a new car brand from scratch. This is the result of a bold vision, ground-breaking innovation and sound industrial manufacture strategy. But what is really selling Tesla cars is the fact that they are desirable and exciting; they are the car of the future, today; a real disruptor of people’s idea of cars. So where does this leave motorbikes? 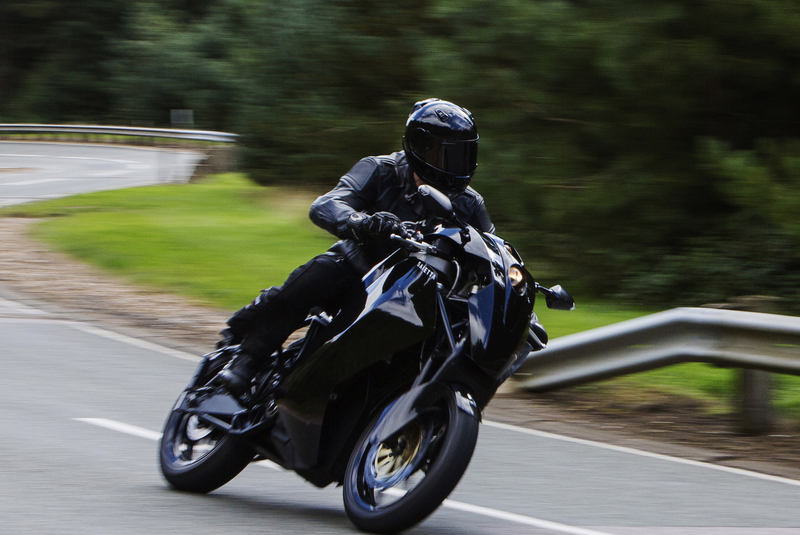 Would an electric motorcycle be appealing to bikers? On the face of it, it doesn’t look promising. After all, what most bike enthusiasts like about their machines is that they have a soul, which manifests itself through the concert of moving parts, smells and noises which their engine makes when revved. A lot of us have an image of motorbikes shaped by our teenage years spent fine-tuning two-stroke engines to make them go faster. So what chance would an electric bike have? A hair-dryer instead of an engine? No chance, right? Wrong. Allow me to continue the teenage/childhood analogy. Before playing with mopeds I played with remote controlled cars. I was always impressed at how quick they were and as I terrified the local cats with the remote in my hands, I had absolutely no problem imagining myself in the driver seat. It is with this frame of mind that I happily accepted the invitation to test-ride the new Saietta R, a british designed electric sports bike. First of all, I need to set the scene with a little background into the company. Agility, the company behind Saietta R, is the brainchild of CEO Lawrence Marazzi. The chief exec. has a background in Formula 1 as well as aerospace engineering. He is also, and most of all, a very keen biker who has dabbled in racing as a young(er) man. He has a real passion for bikes and wants to revolutionize the bike industry by applying the technology he’s seen in F1 and aerospace to motorcycle engineering and design. According to Marazzi, Agility is re-inventing bikes from the ground up; he says “you don’t use Victorian architectural concepts to build a computer” – new technology calls for new frame architecture. That is a radical way of thinking that deserves attention. And Agility is already attracting a lot of attention; in November 2013 they were selected by the Government as one of 16 of the UK’s most promising clean technology companies and were invited to take part in the “Clean and Cool” trade mission to Colorado where they demonstrated the Saietta R.
I won’t go into too much technical details about the Saietta R; others will have covered this more competently than me. However, I’ll highlight the radical bits; First of all, it is the first bike to be built as a monocoque structure. It also sports a double wishbone front suspension; two elements borrowed directly from Formula 1. It has a range of about 120 miles in city use and can be charged up in only 3 hours. It has a top speed of 105 miles per hour and will reach 60mph in 3 seconds (!!). You won’t need to worry about replacing the battery because it has an estimated lifetime of 80.000 miles.These are impressive stats which, in my mind, already make it a contender to some of the best sports bikes on the market. These are all numbers though and only a test-ride can reveal if they are any good on the road. After a long, friendly chat with Marazzi, we both geared up and went to the back of the office where two Saietta Rs were waiting for us in what turned out to be a lovely sunny afternoon. I was shown how to “start” the bike (turn key, push a button) and given some last directions on how to operate it, and off we were. We filtered through London traffic and straight away I was surprised at how much I was enjoying city-riding on a virtually silent bike. I reflected on how this bike would make a great commuter; not having to worry about the clutch, revs, gears etc, allows you to concentrate on the traffic and provides you with a feeling of calm and efficiency which enables you to focus on the road. You also feel like a friendly road user; there’s no scaring of the pedestrians and no bullying cars to the side by revving a loud engine. We then hit the open road and Marazzi gave me a quick glance in his mirror and then disapeared into the distance in a second; ssssssshhh!! No loud noise, just a discreet yet present turbine sound coming out of the electric engine’s inbuilt air cooler. I crouched forward and opened up the throttle; Woooosh! Wow! The Saietta R immediately catapulted me forward, making use of the 100% of torque available from the get go. I scared myself but I always felt incredibly in control of the bike; its dynamic characteristics make for an impressively composed ride and the throttle response is addictive. The Saietta R is very quick and very well balanced; the engineering team even considered the rider’s inner ear when they tuned the double wishbone front suspension in order to ensure that the very small amount of dive would provide enough information to the rider’s brain, yet keep the bike stable and composed. The single seat gives surprisingly good support, which is needed to keep the rider in place under acceleration. The rider’s position is very reminiscent to that of a Ducati Monster. Other than that, the controls are very straight forward, the only exception is that, there being no clutch, both levers actuate the brakes. The display is very simple and packs together an analog speedo and a digital display which gives you some information about the bike. All very clean and tidy and another aspect which adds to the bikes tidyness. I didn’t know what to expect before the test ride but those few moments on the open road opened my mind to a different way of biking; I have seen what the future of motorcycles looks like and I’m very excited about it! I shared the preconcieved idea held by a lot of petrolheads that a bike needs noise, vibrations and smells to be fun. Yet I found that it is precisely the lack of those that made the ride on the Saietta R so special and fun. This bike gives the rider an impression of clean, uncluttered efficency which allows them to focus only on the riding pleasure. It also demonstrates that actually, the feeling of power does not come from a roaring engine between your legs. The dynamic characteristics of the Saietta R do that for you without the noise and vibrations. Once you have given it a bit of throttle you instantly understand its power and learn to respect it. As far as I’m concerned, the silence of the bike is one of its coolest features. After the test ride I had the opportunity to take a closer look at the Saietta’s design. It is obviously a radical design, quite futuristic. Marazzi explains that it wouldn’t have made sense to build such an innovative bike and make it look like any other bike. He has a point. Having no conventional engine or gearbox, Agility was able to use space as efficiently as they could and having the freedom to shape the battery pack like they wanted also enabled them to distribute its weight efficaciously. The Saietta R looks futuristic and it certainly stands out from the crowd. On my test-ride two cab drivers struck up a conversation in the traffic, asked questions, gave us the thumbs up and took pictures. Many heads turned as we rode by and we were followed by biker cops whom I know were just curious. When we arrived back to the Agility office, a homeless man, and American with a big camera and a bunch of students all rushed to take a close look and ask questions about the bike. I hadn’t experienced this level of attention since, as a teenager, my dad and I restored and drove around in a 1930 Citroen. It certainly makes you feel special and that’s another feather in Saietta R’s cap. 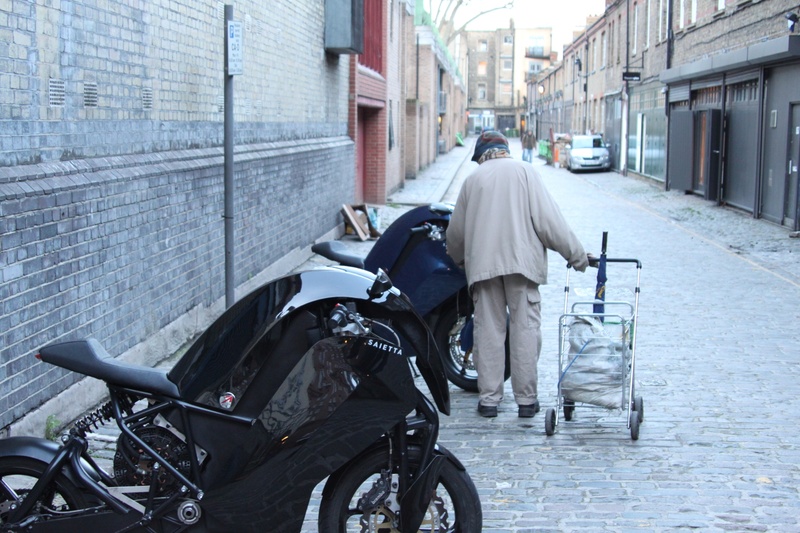 Agility can be extremely proud of what they have achieved so far; A british company (call it a startup if you wish) led by a super talented, super enthusiastic engineer has managed to rewrite the script about motorcycles. Sure, they are not the only company which produces electric motorcycles, but these guys are aiming very high and their end product is premium. You won’t find the technology they’ve put in the Saietta R in other electric bikes. They’ve also managed to create a very credible brand which is backed up by big names in the industry. The future is here, embrace it! So would I buy one? The answer is yes. If I was on the market for a naked bike I’d definitely consider it seriously. Just because it’s a lot of fun, it’s different, very well built and quite frankly, my R1150GS now just feels like a big heavy lump of steam-era machinery (I still like it though!). What I take out most from this test-ride is that we are at a crossroad for motorcycling. Petrol-engined bikes still have bright days ahead of them but they will have to compete with the likes of the Saietta R and will have to start innovating a lot more to stay relevant; the industry is being disrupted. Also, I am now convinced that electric bikes are becoming a real alternative to conventional bikes. And I’m excited about this; we are going to see a lot of cool things happening in the world of motorcycles in the coming years. Watch this space!